Where Do They Come From and What Do They Mean? Octagrams – eight pointed stars – show up in a variety of different cultures, and modern users of the symbol borrow liberally from these sources. In Babylonian symbolism, the goddess Ishtar is represented by an eight-pointed starburst, and she is associated with the planet of Venus. Today, some people equate the Greek Aphrodite, whom the Romans equated with their Venus, with Ishtar. Both goddesses represent lust and sexuality, although Ishtar also represents fertility and war. The number eight frequently represents beginnings, resurrection, salvation , and super-abundance. This has to do, in part, with the fact that the number seven is a number of completion. The eighth day, for example, is the first day of a new seven-day week, and a Jewish child enters into God's Covenant on the eighth day of life via circumcision. Old Kingdom Egyptians recognized a group of eight deities, four male and four female, with the female bearing feminine forms of the male names: Nu, Nanet, Amun, Amunet, Kuk, Kauket, Huh, and Hauhet. Each pair represents a primal force, water, air, darkness, and infinity, and together they create the world and the sun god Ra from the primordial waters. Together, these eight are known as the Ogdoad, and this context is borrowed by other cultures which may represent it with an octagram. The second century Gnostic Valentinius wrote about his own concept of the Ogdoad, which again is four male/female pairs of what they considered primordial principles. First, Abyss and Silence brought forth Mind and Truth, which then produced Word and Life, which finally produced Man and Church. Today, various pursuers of esoterica have drawn upon various concepts of the Ogdoad. In Hinduism, Lakshmi, the goddess of wealth, has eight emanations known as Ashtalakshmi, which are represented by two entwined squares forming an octagram. These emanations represent eight forms of wealth: monetary, ability to transport, endless prosperity, victory, patience, health and nourishment, knowledge, and family. Octagrams formed from overlapping squares often emphasize duality: yin and yang, male and female, spiritual and material. Squares are often connected with the physical world: four elements, four cardinal directions, etc. Together, they can mean both positive and negative aspects of the four elements, for example, and balancing them. Esoteric thinkers working with Hebrew and the names of God might place the Hebrew letters for YHWH and ADNI (Yahweh and Adonai) within the points of an Octagram. 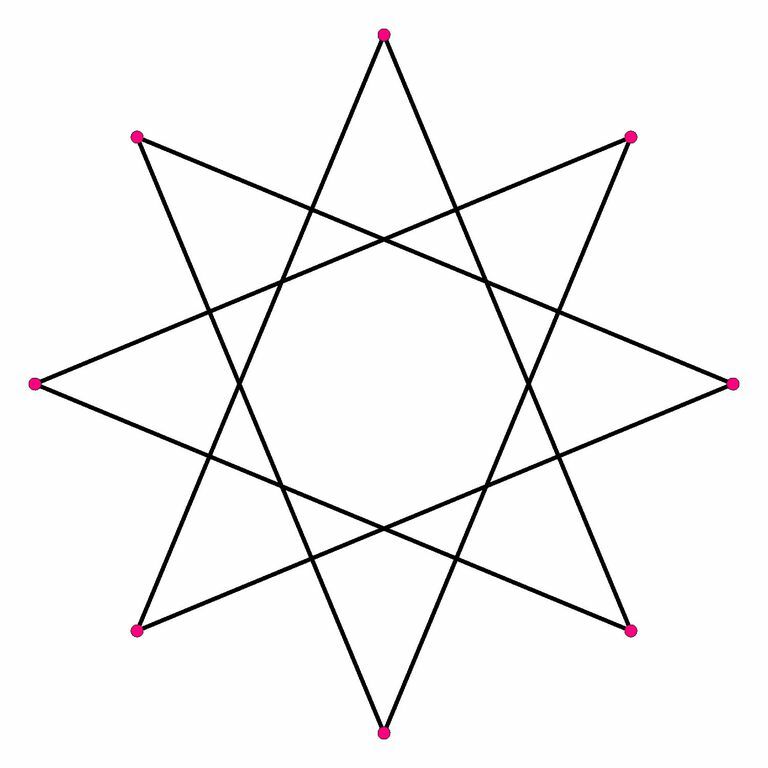 A chaos star is eight points radiating from a central point. While originating in fiction – specifically the writings of Michael Moorcock – it has now been adopted into a variety of additional contexts, including religious and magical ones. Most notably, it has been adopted by some as a symbol of chaos magic. Buddhists use an eight-spoked wheel to represent the Eightfold Path taught by the Buddha as a means to escape suffering through the breaking of attachments. These paths are right view, right intention, right speech, right action, right livelihood, right effort, right mindfulness, and right concentration. The Wiccan Wheel of the Year is commonly represented as a circle containing eight spokes or an eight-pointed star. Each point is a major holiday known as a Sabbat. Wiccans emphasize the system of holidays as a whole: each holiday is influenced by what has come before and prepares for the one approaching next.